A DEFINITION FOR THE OPEN LIBRARY The proposed project moves from a question: what does it mean to design a Library in a historic time in which the technology has radically changed the way of transmission and disclosure of knowledge? The answer given is to hypothesize a cultural center where the reading of a book is only one of the possible activities to be performed in. 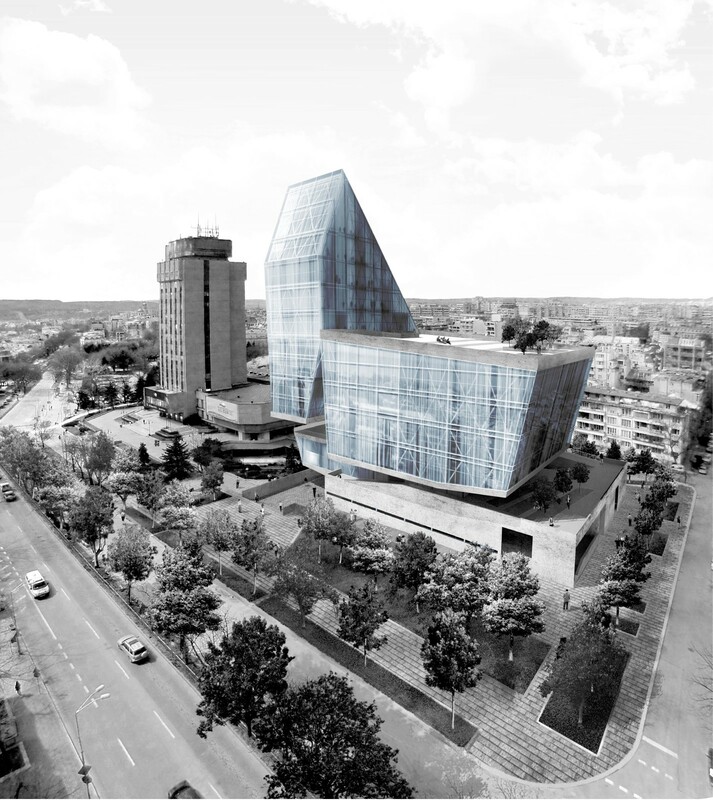 The Library presented to Varna is a place of cultural exchange and social meeting open to the city, where to consume culture rather than objects; a place that aims to create vitality. 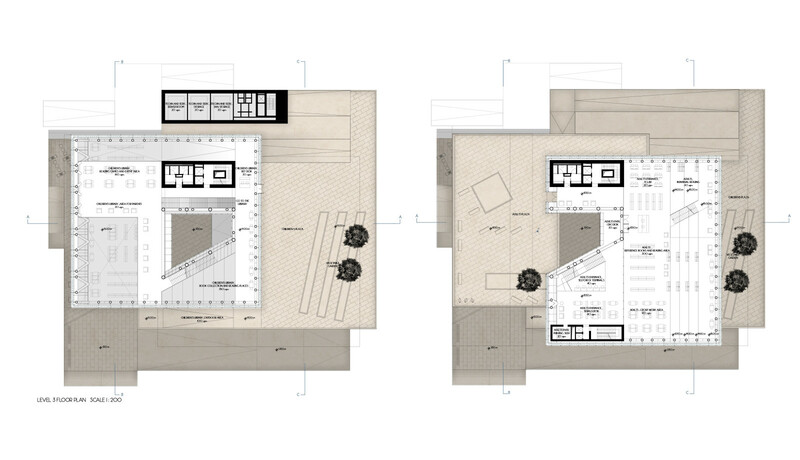 In order to achieve this goal, the project works through a system of relations between filled and empty elements. The filled ones house the system of the main functions, represented by the volume of the Lobby and the 3 Libraries making up the unique organism (3+1=1), that identify the different types of users that the library will welcome in. 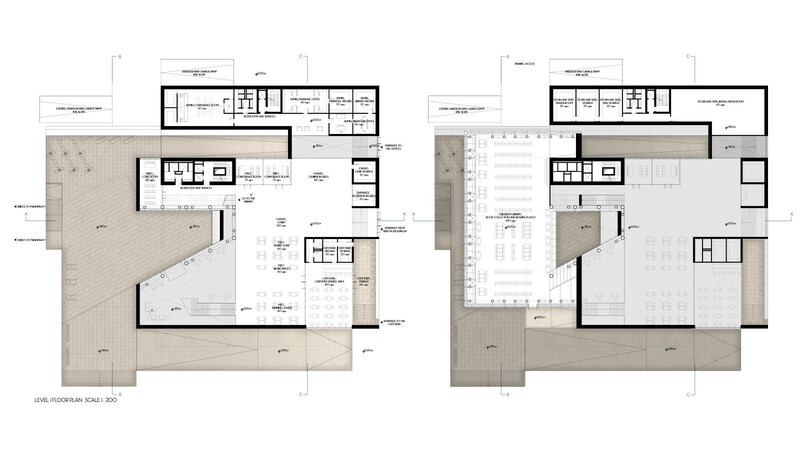 A choice that ensure both the recognizability and a highly flexible use of the space in times. 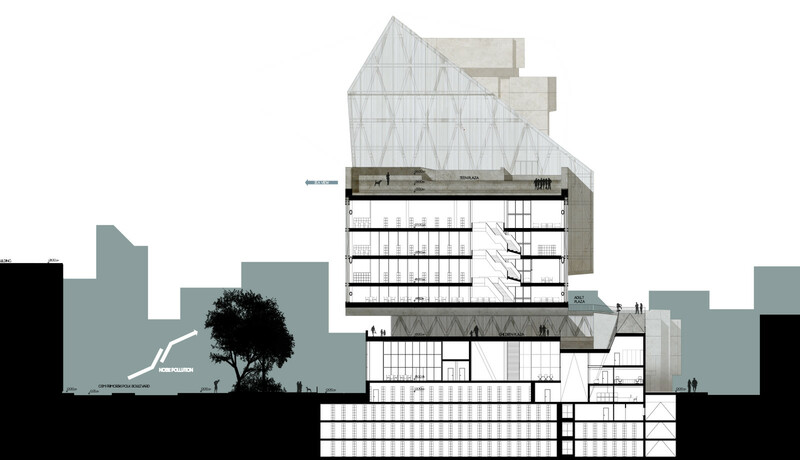 The void formed by the system of the public space, link the different functions by making the organism permeable by the users, both in its inner and external spaces. The unique public area that is placed at the ground floor is now distributed over the Lobby and the three Libraries volumes (1=1+3), giving back more outdoor areas to the Open Library. 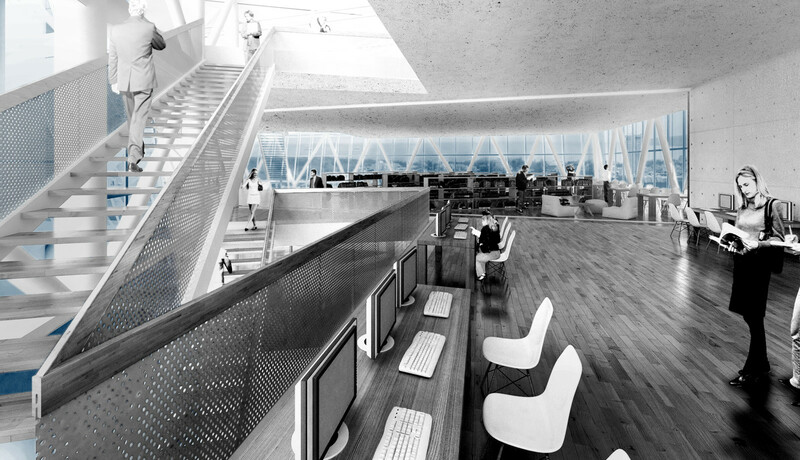 The permeability of the Open Library is insured by the two-paths system of flows, that combines both horizontal and vertical connections, providing the opportunity to enjoy all the spaces and all places anytime. 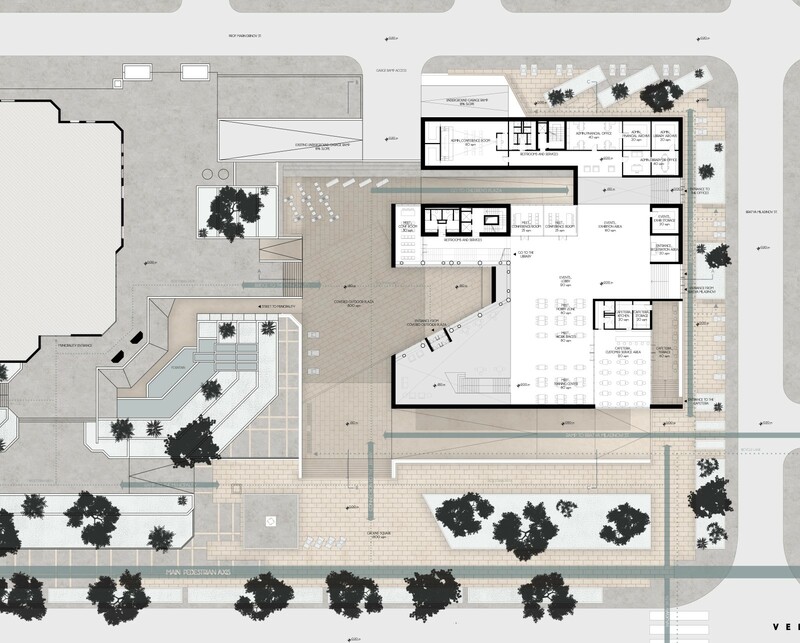 The main idea that aims the design is to ensure an indoor continuous path that keeps all the functions linked and accessible starting from the ground floor to the highest level. At the same time, the project designes the outdoor squares and reading areas as Landscape observations points, where to look at the urban skyline from a new point of view. The project proposed aims to open the Library to the users, so as to promote the approach not only to the reading but also to the transmission and discolsure of knowledge. The public spaces are distributed at each level to offer to the visitors a new observation point of the city itself, as well as to host outdoors reading spaces. 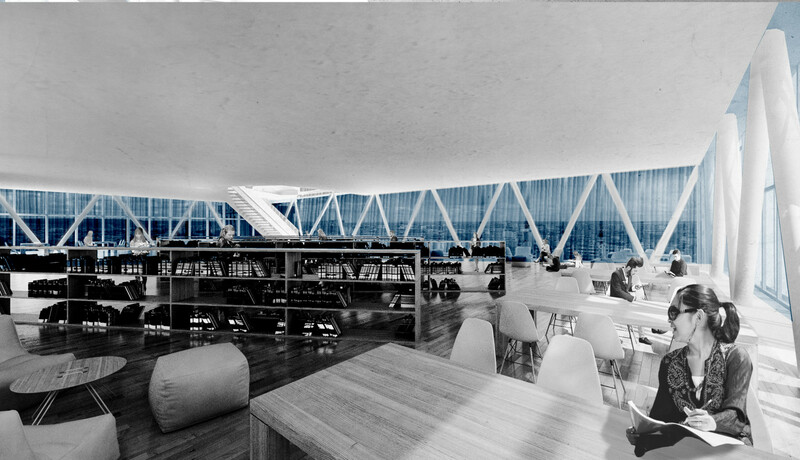 In the central space placed between the translucent volumes you can stop and enjoy the Library from the outside. Reading is not relegated only in indoor spaces, but lives outside and it is powered by guests visits. It is a process of advertising and sponsorship of the place: the Library belongs to the city and the city belongs to the Library, to create permeability and endless discovery. with: Manlio Amadio, Antonio De Paolis, Natalia Gutiérrez Jorge, Luca Gaetano Malvasi, Benedetto Montalbano.